You won't see something like this one again. 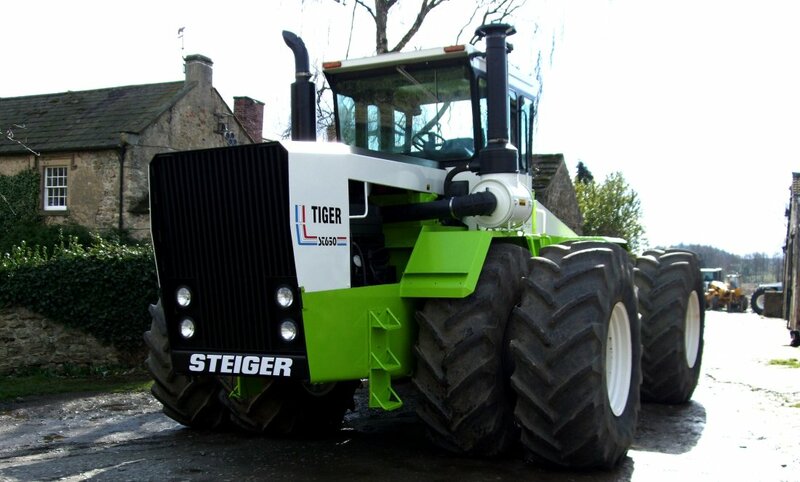 I've been asked if I would sell our Steiger Tiger many times. The stock answer was "NO", it's my tonker toy. After all where would I find something to top it. 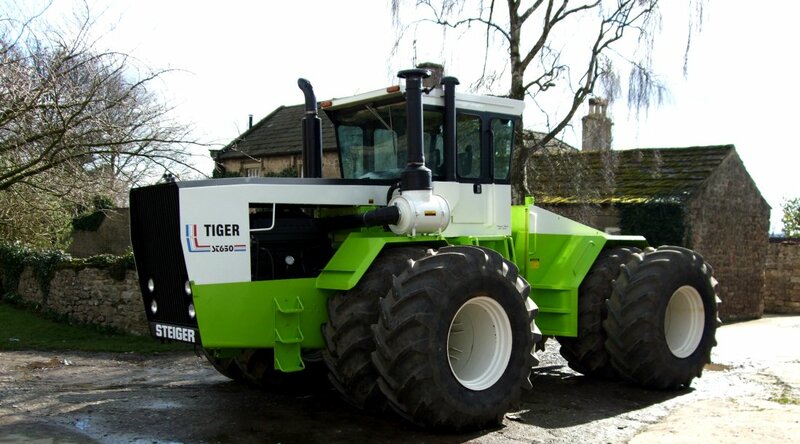 A 700 bhp tractor with only 1400 hours on it, and eight Michelins to match. However our acreage is now reduced, and it barely gets warmed up before it's finished work for the year. and it's done all our primary cultivations each year within those hours. Nice, but we don't need it. 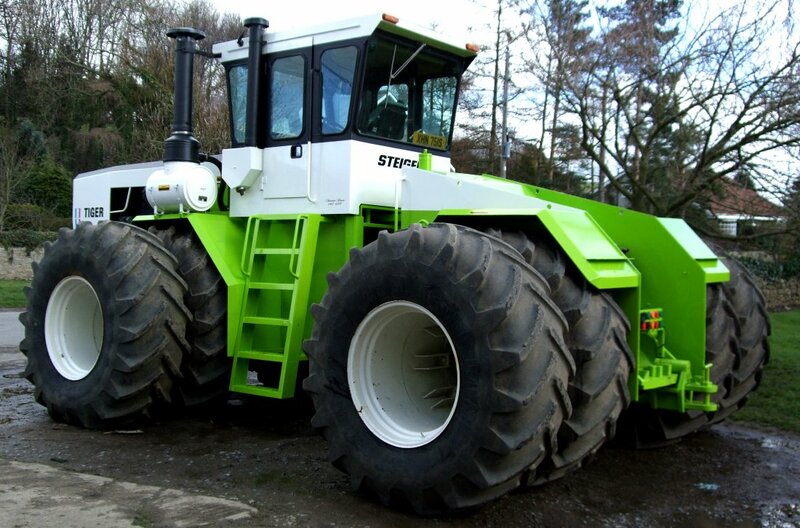 It may well be the most powerful tractor in use in Europe at the moment. 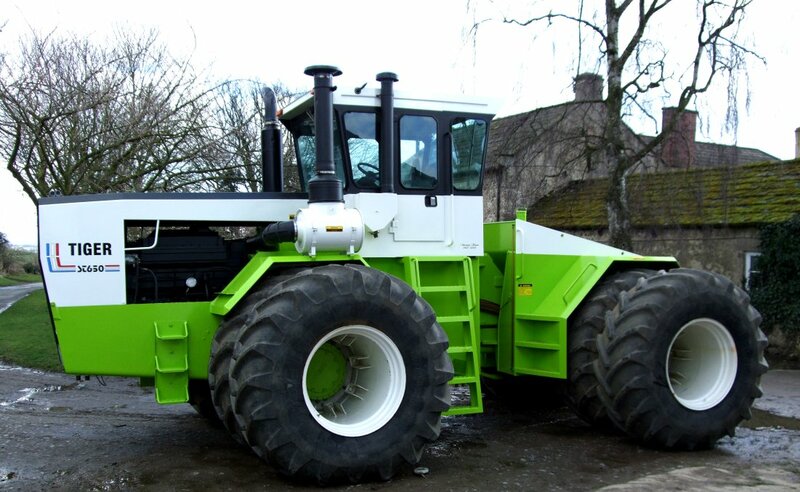 It has been developed and improved in that time, as has the 9M Kvernland CTD cultivator bought for it. This now has 31 tines on three rows, the last two also fitted with 19" wings, and then the packer. These 40mm square pigtails are no joke. Something was needed capable of reaching 8" to 10" on one pass, and the KV tines wouldn't hack it. The break back pressure they can take is only 700kg on the point, as opposed to 1000kg for the pigtail tines. The point and wing cutting edges are Tungsten Carbide tipped, and the point faces are hard faced. Last autumn this combination did 418acres (169 ha), - our primary + autumn cultivation at 9" (23 cm). The + being the stirring action and the press, leaving only one light disc pass to do before the drill. It took four part days and used 579 UK gal (or 695 US gal = 2630 litres) of fuel. The soil was rather wet, which uses much more fuel. At 68 pence per litre that cost £1788, which is £4.28 per acre (£10.57 per ha). That's about £4.78/ac including costing the driver, and we're still using the same points as last year. They've been re-hard faced, and will go again next year. The wings on the machine are still the originals . We also had 93.6% of our total arable acreage drilled up. The rest was either under water or already worked but a bit moist ! Two miles away there was a field of wheat cut by someone on 1st Nov.!....! I'm no expert, but to me that looked fairly positive, especially when one looked over the hedge. In the wet our system isn't going to travel when a power harrow following the plough will. However two days later things can turn brown very cheaply and real quick. 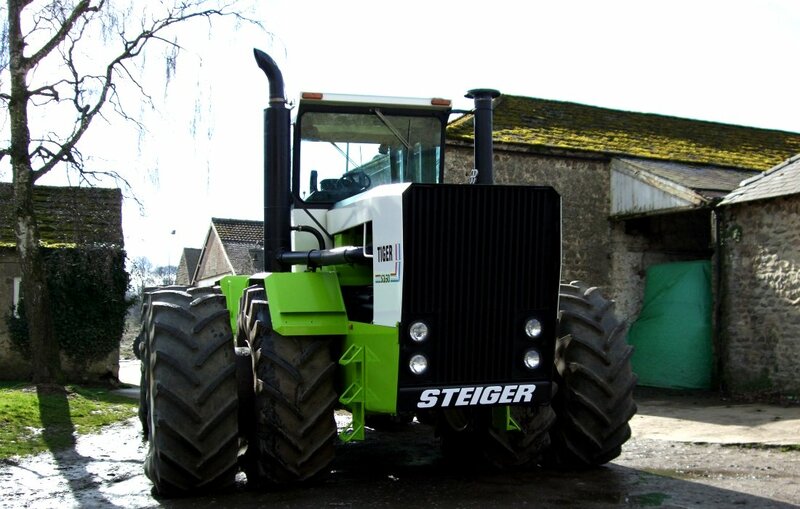 Steiger Tiger S III ST 650. Retuned and modified. Twin 710/75 R 34 Michelin XM 27. Seven double acting hydraulic outlets. Now with 10 double work lights, effectively 20 halogen lights, and 160 amp alternator. Six speed Alison Powershift with Torque converter. 6 Cyl, Cummins KTA 19 engine . Approximately 705 bhp (509kw) @ 2100 rpm. 2328 lb/ft (3157 nm) @ 1400 rpm. Safety Cab Approval and registration acquired for the UK. Finished inside in Jaguar fawn faux leather . The Tiger story so far. July 2004. 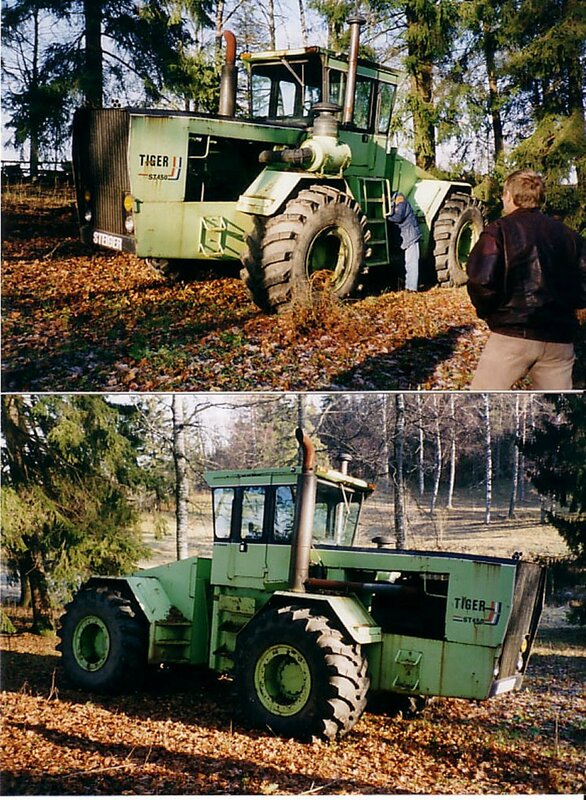 Found in a wood in Finland looking rather sad with right steps missing and two flat tyres. Shipped in 1979 to the Kirov Factory in St Petersburg for evaluation, to see if they could be made under licence in Russia. 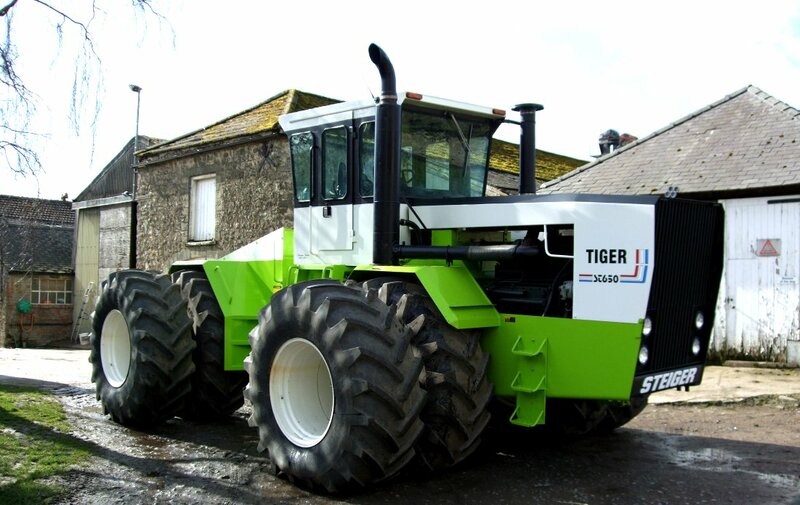 Bought by an Estonian farming company who recorded a further 880 hours . In 2002 it was acquired by a Finish collector and parked in the wood seen above. It arrived here having done a total of 1047 hours from new. And the then 470 bhp Tiger up front knew all about it being there ! 7.5 metre Simba 23C discs towing 8.2 metre Galucho Tilthmaster . Does 6.5 mph but needs more tyre (and more grunt). 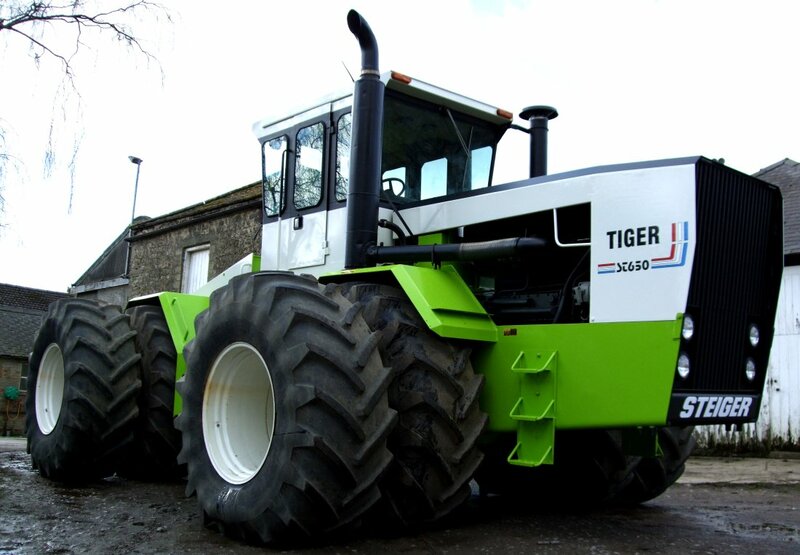 It has now done 1322 hours since new and now been stripped and repainted in our own colours. The engine has also been stripped, checked out, and rebuilt to exacting standards. 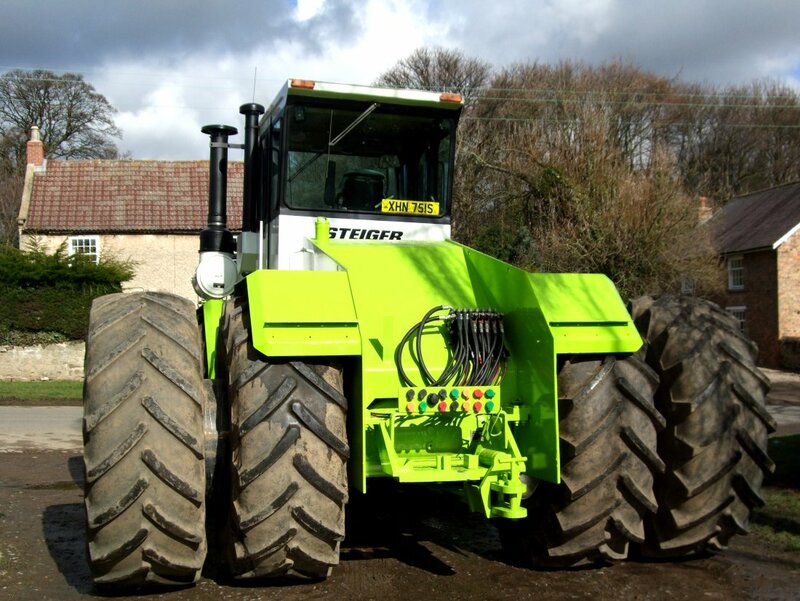 Now about 705 bhp + with Twin 710/75 x 34 Michelin XM 27 wheels. mounted on three rows with 87 cm spacing. The working point spacing is 29cm. 7 cm wide Tungsten Carbide tipped points, 2 cm thick. The last two rows also have 40 cm wide Tungsten Carbide tipped wings. This is followed by the packer rollers. The original tines had 700kg breakaway point pressure. They are capable of penetrating dry stubble on our land to a depth of 25 cm (10") in one pass. She was purchased by a family owned contracting company near Glasgow. There were three large multinational companies, all interested at the end. and the family owned contracting company moved much quicker. now that we have a formula.